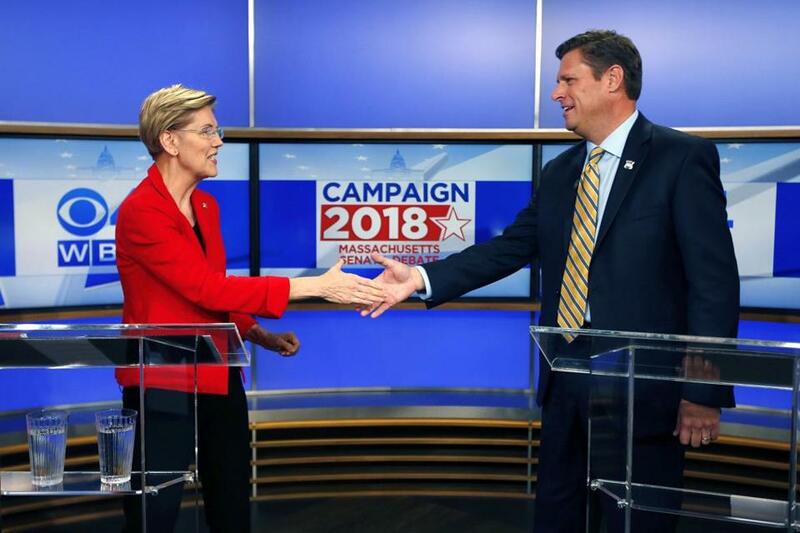 Massachusetts Senate candidates Senator Elizabeth Warren (left) and her opponent State Rep. Geoff Diehl shook hands before a debate. The televised face-off Friday night between Elizabeth Warren and her Republican challenger, Geoff Diehl, was ostensibly about a Senate seat, but neither candidate could stop talking about the Oval Office. Diehl, who served as cochair of Trump’s 2016 campaign in Massachusetts, hammered Warren for her potential presidential ambitions, seeking to paint her as an absentee senator interested only in preparing for a run for the White House — and not tending to home-state needs. Warren has said she would take a “hard look” at a presidential run after the midterm elections. “She doesn’t care about your house, she cares about the White House,” Diehl said. The hourlong debate, which aired on WSBK-TV (Channel 38), marked the first time Warren had to grapple directly with her opponent. She had, until Friday, studiously avoided acknowledging his existence as much as possible, rarely referring to him in any way. The two digital ads she released this week do not even mention she is running for reelection to the Senate. For Diehl’s part, the debate was an opportunity to scrounge some attention, which has proved difficult against the high-wattage Warren, who holds a mammoth lead in public polls and fund-raising. The result was a scrappy back-and-forth, the candidates talking over each other — “Can’t understand either one of you,” the moderator, WBZ-TV political analyst Jon Keller, scolded at one point — and plenty of snarky shots. Not even a full minute of the debate passed before Diehl brought up Warren’s controversial decision to take a DNA test to prove her claims to Native American ancestry. The results, which she made public this week, provided “strong evidence’’ she had a Native American in her family tree dating back 6 to 10 generations. “I don’t care, Senator Warren, about what your Native American heritage is or isn’t. I think it’s about integrity,” he said. In response, Warren referred to a Globe investigation that found clear evidence, in documents and interviews, that her claim to Native American ancestry did not help her professionally. “Mr. Diehl knows this, and the reason he raises it is he’s just trying to do Donald Trump’s bidding here,” Warren said, while also stressing she has never claimed tribal citizenship. “You’ll hear a lot about Donald Trump in this debate because Senator Warren clearly wants to run against him in the 2020 elections,” Diehl shot back, running through a list of other states Warren has visited recently while he campaigned for the Senate seat around Massachusetts. The debate also highlighted the stark differences between the two candidates on a range of issues, including gun control (Warren hammered Diehl for being endorsed by the National Rifle Association); the Republican-passed tax cuts (Warren called them a giveaway to billionaires and giant corporations, while Diehl defended them as a boon to the Massachusetts economy); and a ballot question on whether to keep the state’s 2016 transgender antidiscrimination law (Warren wants to keep it, Diehl voted against the original and says it could enable sexual predators). The two clashed nearly nonstop, substantively and rhetorically, often interrupting or responding to each other without prompts. Trump permeated nearly every exchange — whether Warren was working to tie Diehl to the president, or Diehl was voluntarily aligning with the administration’s positions. On immigration, Diehl criticized Warren for her opposition to Trump’s controversial travel ban on several predominantly Muslim countries, which the Supreme Court ultimately upheld in June following a series of legal challenges. During a testy debate on taxes, Warren and Diehl talked over each other several times, with Warren charging that Republicans were targeting Social Security to balance the red ink caused by the Republican-backed tax cuts. Diehl said that was a suggestion by Senate majority leader Mitch McConnell. Diehl argued that McConnell had “just made the news” with the comments. The tax talk got personal, too, with Diehl hitting Warren for overvaluing the worth of donated clothing and household items on her taxes, and Warren challenging Diehl to release 10 years of his tax returns online as she did earlier this year. “Geoff Diehl has put exactly the same number of tax returns out in public as Donald Trump has — zero,” Warren said. Veering into foreign policy, the two offered contrasting takes on the death of Jamal Khashoggi, who Saudi authorities acknowledged Friday was killed inside the country’s consulate in Istanbul. Warren said the situation called for a stronger response from Trump, and questioned whether he may have unforeseen ties to the country that could be disclosed in his tax returns, which he has not released. “This is the most corrupt administration in living history,” she charged. Diehl called Saudi Arabia “clearly a strong ally in the past,” and emphasized the importance of upholding the United States’ connections with Saudi leaders. can be reached at victoria.mcgrane@globe.com. Follow her on Twitter @vgmac.